July 13 and 14 is going to be a wonderful weekend of fun and excitement for all ages on the Mississippi Gulf Coast. It is time once again for Marty Wilson’s Croaker Classic which has been going strong now for 6 years! The prizes are incredible, with a $10,000.00 first place prize for “the biggest croaker that hits the dock.” Marty Wilson loves to fish. He has been fishing on the Back Bay in Biloxi since he was a little boy. “Salt water runs through my veins,” he said. The Dock Bar and Grill on Seaway Road in Gulfport is the place to be for all the action, and fun. At 6:00 p.m. Friday, July 12, the event kicks off with a Captain’s Meeting. Fishing begins at the crack of dawn the following day at 5:00 a.m. Weigh ins commence at 3:00 p.m. each day and Live entertainment will be featured on the Tiki Deck. Don’t miss Michael Vincent and Double Shot on Saturday, and 5 Day Run on Sunday. The Croaker Classic was created around a plentiful species that everyone can catch. Croakers aren’t fussy. You don’t need fancy lures or expensive equipment to catch them. Marty decided it was the perfect choice for his family fishing tournament. The Croaker Classic was launched in 2008. Now kids could have a shot at winning the same big prizes that are usually reserved for adult competitors only. 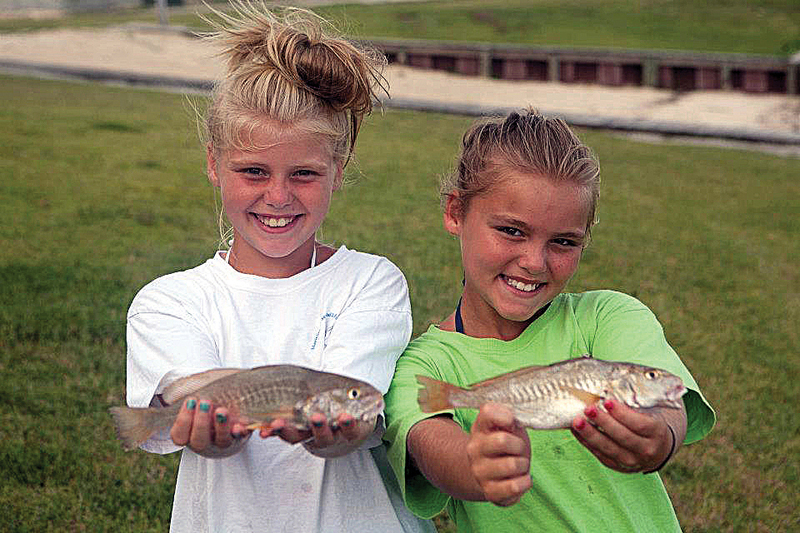 When you think of fishing for croakers, they are not synonymous with big purses and over the top prizes. Marty Wilson and his very generous sponsors changed that. “I wanted people to get a laugh out of the concept of this thing but I also wanted to shake up the pot and make it a very serious competition, so I started out with a $5,000 winner take all purse,” Marty said. The Croaker Classic is a one-of-a-kind Mississippi Coast treasure that was specially designed for families. “This weekend is all about parents, grandparents, aunts and uncles, and friends, fishing with kids and just having a great time,” Marty said. The Croaker Classic has some very strict rules and regulations that must be adhered to. With a $10,000 first place prize at stake and many big ticket items such as a two man kayak, wet suits, dive cameras and much, much more…this is serious business. Registration is $25.00 per angler and all fish must be caught during the specified dates and times of the tournament. All fish must be weighed in on the day they are caught and they must be caught inside the Ocean Springs Bridge in the Back Bay of Biloxi. If you go south of the bridge, you will be disqualified. Fish must be caught on a rod and reel only! All fish must present in good, fresh condition. They will be inspected for cloudy eyes, pink gills, and any sign of mutilation or being frozen. All decisions are made by the weigh master and are final. All the rules and regulations are posted on the website as well as registration information. Redfish and Black Drum categories have been added this year. For an additional $20.00 registration fee, ($10 for the Redfish, $10 for the Drum) you have the opportunity to win even more money! Winners split the pot. It’s a small price to pay for a chance to win several hundred dollars or more. Last but not least, Marty decided to make one more change. Now anglers can use paddle boards or kayaks this year. The biggest croaker caught during the Classic to date weighed in at about 4.3 lbs. Somewhere in the Biloxi Back Bay, the granddaddy of all croakers is waiting. Whoever catches him is going to take home $5,000 cash and a brand new hot tub furnished by Leisure Home Products valued at $5,000. Fishermen (or women or youngsters) who place in the top 5 overall will be awarded ice chests filled with amazing surprises thanks to the good people of Academy Sports & Outdoors. Pelagic Gear, Advanced Collision, Dad’s Super Pawn, and The Dive Shop in D’Iberville are major contributors of prizes as well. There are also 15 places for winners in the children’s division. (ages 15 and under). You and your family members can’t be in the running if you aren’t registered. Be sure to reserve your spot! Deadline is July 6 at 10:00 p.m. Marty Wilson is so appreciative for all the generosity and support he has gotten from the many local businesses. “I have such great sponsors. 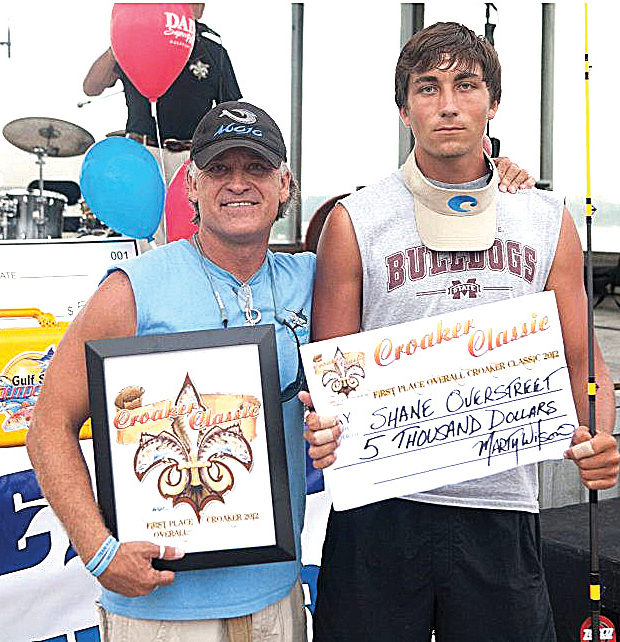 They make the Croaker Classic a tremendous success year after year,” Marty said. The proud father of two daughters, Marty Wilson is first and foremost a family man. Myia Love is twelve years old and older sister, Tori, attends Mississippi State on a full four year scholarship. The girls love the outdoors as much as their dad does. Marty travels extensively but home is and always will be in South Mississippi. His roots run very deep. Raised in Biloxi on the Back Bay, he spent an idyllic childhood fishing and being outside most of the time. His mother, Jackey, taught Art in the public school system for 18 years. His father holds a bachelors degree in Fine Arts. Marty was encouraged to draw and paint from a very early age. He exhibited exceptional talent as time went on and his mother did everything she could to support his efforts and guide him. At the age of 16 he had his own airbrush business painting t-shirts. The designs were extraordinary and everyone wanted to own one. This was the beginning of what would become an illustrious career in the art world. Marty Wilson is one of America’s finest marine life artists. His work is sought after by by collectors and celebrities throughout the country and he has garnered many awards for his paintings. Marty explores the ocean through diving and taking photographs of the fish and marine life he encounters. He studies every nuance; the way they move, the colors, the contours and textures of their bodies, their variance in size and shape…everything. He sketches and paints what he sees but also what he feels. If you are familiar with Marty Wilson’s work, you know that his paintings of salt water creatures are so lifelike and so animated that they seem to leap off the canvas or page. The details are remarkable. You feel as if you are looking right into the eyes of that fierce marlin and the spray of the salt water is stinging you as the fish thrashes and fights to be free. It is extremely difficult to capture such movement and power and so skillfully illustrate the raw beauty of nature. Marty Wilson paints what he knows. His vast experience as a fisherman and diver has provided him with a wealth of information about salt water fish. They are his favorite subject to paint and the cornerstone of his career. Marty is a painter first and foremost but he is not adverse to using different styles and concepts to create his marine life art. Currently he has been focusing on the Japanese art of Gyotaku. Fresh caught fish are used to print the actual image of the fish on paper or cloth. Marty is putting his own special touch into the process and the result is nothing short of spectacular. The fish are sometimes enormous specimens and it is no easy task to get the print made. It is all done by hand and often requires Herculean strength to lift the fish and properly place it where it needs to be. At the time of this interview, Marty was in Destin, Florida, where he was on a deep sea fishing trip to catch red snapper that were going to be used for Gyotaku. “I enter a state of euphoria when I paint. I am totally immersed in the moment but it is also very lonely. I am unable to share the experience with anyone, it is something I must do alone. The creation of my art is a totally solitary thing, so when the bells and whistles go off and I stand back and feel really good and very pleased at how things are coming together, I am by myself. When the really cool stuff happens it is often at 2 or 3 in the morning. I paint every day and whenever the mood strikes. I don’t worry about what time it is,” Marty said. The Marty Wilson brand is growing in leaps and bounds. Marty has a clothing line, a swim wear line, and a jewelry line, all of which are a result of his beautiful paintings and art work. He is a very busy man, with many irons in the fire.The internet has opened up even more opportunities. The workload is now split between actual painting and the computer. “I have been forced to become a graphic designer because that is what people want these days. They want to be able to use my art work in new ways with new applications so that they can profit from it,” Marty said. Apparel and accessories are key in today’s national marketplace. Marty is working toward his ultimate goal of owning a nationally recognized brand in the fashion industry. A canvas of 2 ft by 3 ft requires approximately 250 to 300 hours of work. “When I paint, I paint every feather or every scale. It takes a very long time to accomplish such detail and I never rush the process. I am a perfectionist, everything must be done right because that is what is most important to me, that is what feeds my soul,” he said. All of Marty’s paintings are inspired by actual events and his own personal life experiences. Exploration of the ocean and a fascination with big game fish fuels Marty’s imagination and creativity. “I am so completely humbled by the way things have turned out. Initially, my only real desire and plan was to make a living for my family. I never imagined in my wildest dreams that I would have this career, doing what I love so much. I am a very lucky guy. I have had so many amazing opportunities along the way and I am really looking forward to whatever comes next,” Marty said. For more information about purchasing art or apparel from the Marty Wilson collection, or if you would like to speak with him about a commission or special project, call 228-265-1121 or visit his website at martywilson.com or find him on facebook.